Yesterday I started spinning some vanilla colored Ashland Bay Portuguese Wool Top Spinning Fiber. After spinning about 20 oz I decided I could not spin that vanilla color one more minute. It was so boring I almost fell asleep at the wheel. Yawn. I kept saying, “Dye it when you’re done.” Didn’t work. 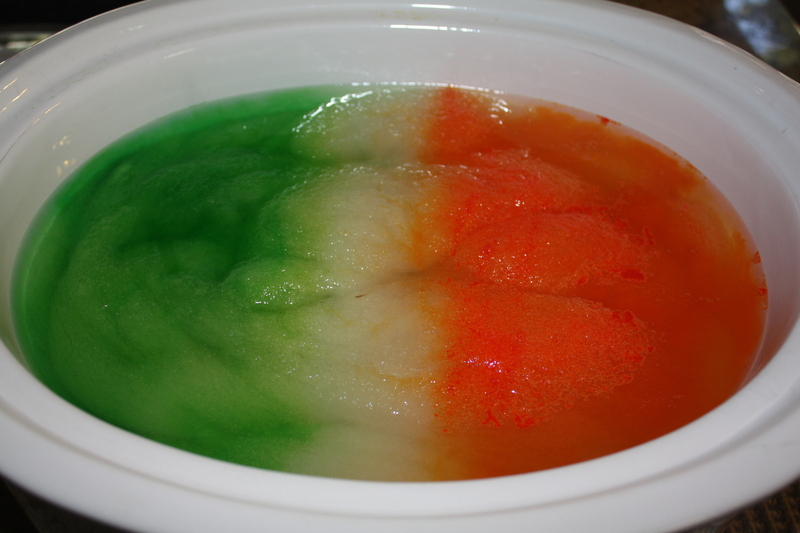 Pulled out the crockpot and some KoolAid. I tried a new dyeing method. Don’t you just love craft blogs? I found this method at the do stuff! blog. This should make kind of a “spotchy” yarn. Filled the crockpot with water and added some vinegar, even though Kool-Aid has citric acid this is thick wool and I wanted to make sure. Added the wool, poked it down, turned it over, tons of air in this top. You can see air bubbles in the picture. Soaked for about 20 minutes. Then turn crockpot to high; it only has a low and a high setting. Let it “cook” for an hour. Sprinkled Lemon-lime color on one side and orange on the other. Yes, the Kool-Aid package was torn open and sprinkled directly onto the yarn top. I did have to poke the orange a bit so it would dissolve. You can see some of the orange Kool-Aid chunks in the picture. I left a swath of neutral color in the middle since I know the colors will bleed together. Kinda reminds me of the Italian flag! Top back on and let it cook. 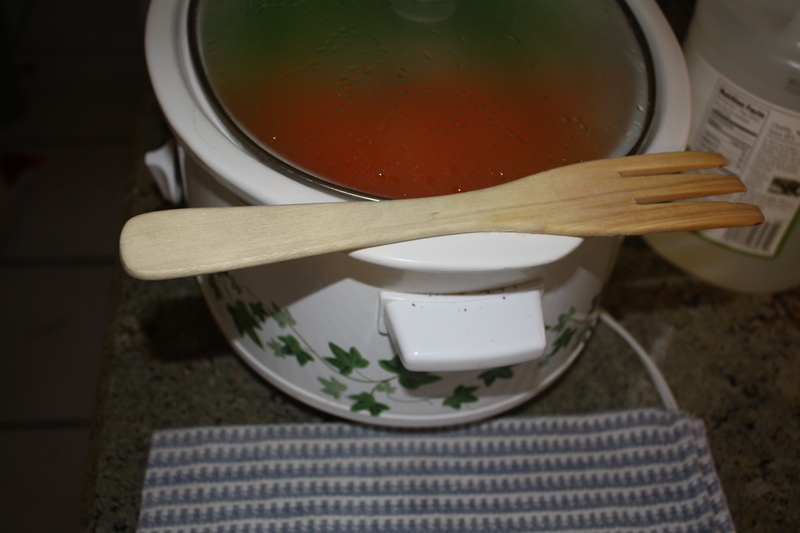 Had to show this picture of my favorite dying tool – the wooden fork! 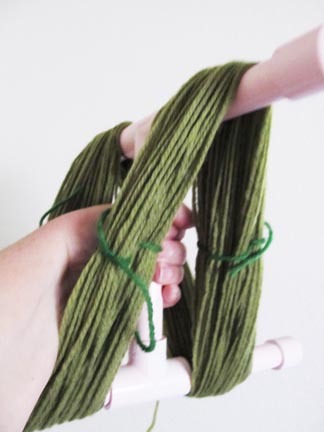 It is the best yarn-poker, turn-the-wet-yarn-over, and lifter-out-of-pot tool ever! After about 30 min the dye was exhausted. 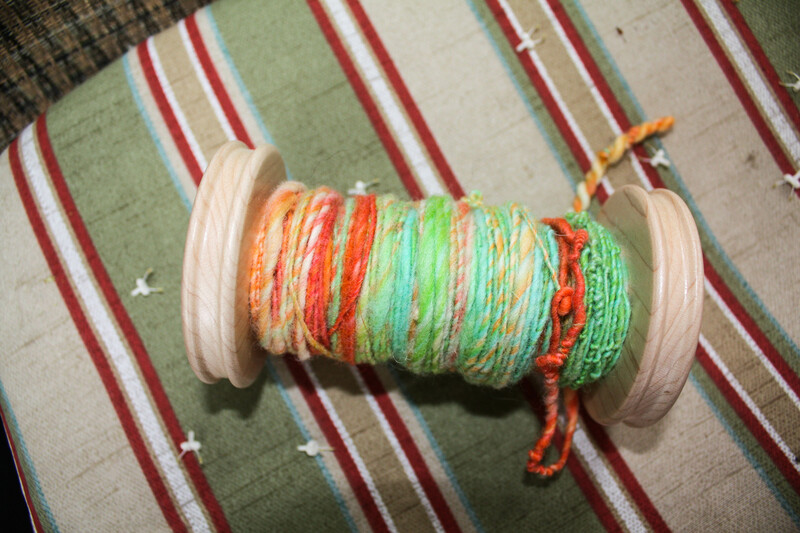 I carefully turned the yarn over, making sure I kept the green side to the left and orange to the right. This time, I sprinkled blue on the green side and 1/2 of the strawberry package onto the orange side. Red is so strong it will just take over if a whole pack is used. Blue + green = Blue-green; Red + orange = red=orange. Yum! Last dye step. After all of the blue and the red have been exhausted, look for any white spots and add yellow lemonade. 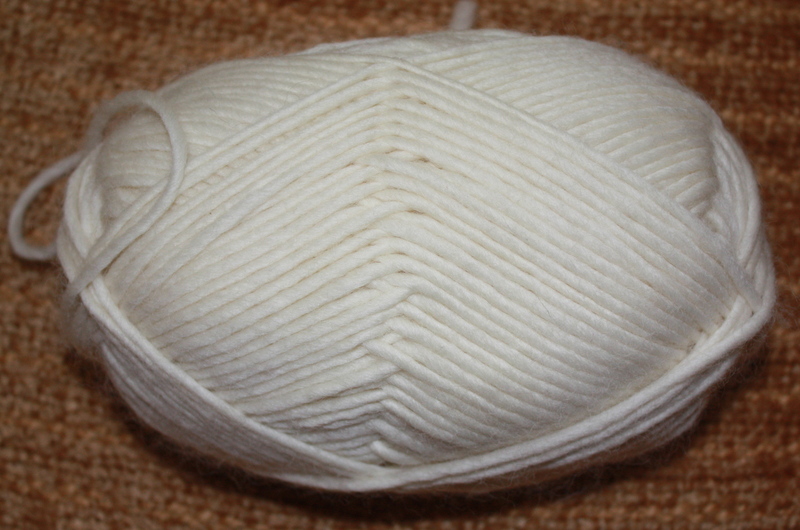 You can see that there is a small white line going around the yarn top. 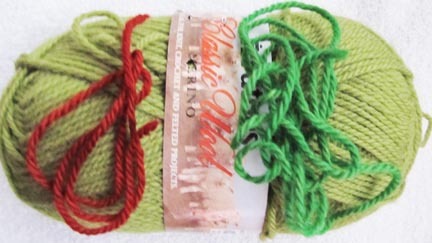 Gently turn the yarn and add yellow to the back portion. Now the yellow lemonade has been sprinkled all around. After the yellow has been exhausted, I let the yarn cool down in the crockpot. 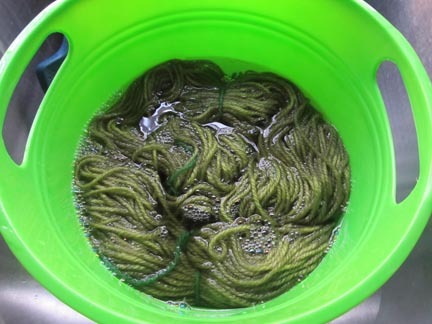 With spun yarn I dump it into a colander to drain the water. This is my first time doing a top, it seems more fragile. I did not want to agitate too much, so I turned the crockpot off and let it cool down slowly. Ta Da! The final product. I let the top cool down in the crockpot, carefully lifted into the colander to drain for awhile, then gently rinsed in a cake pan. Now it’s on the boot tray to dry. Love the boot trays from Target. They are large, heavy, unbreakable plastic, with about 1/2 inch lip all around. Perfect for putting wet yarn on. My husband said, “It looks like cotton candy.” 😎 Really is quite vivid. When it dries, I’ll spin it. Can’t wait to see how the splotchy colors turn out!!! Easy peasy way to dye. Off to sister Barb’s today. What trouble can we get into? At least, how much trouble can we get into that allows Curls to sit with her sprained ankle up? Dyeing to Meet the Challenge! 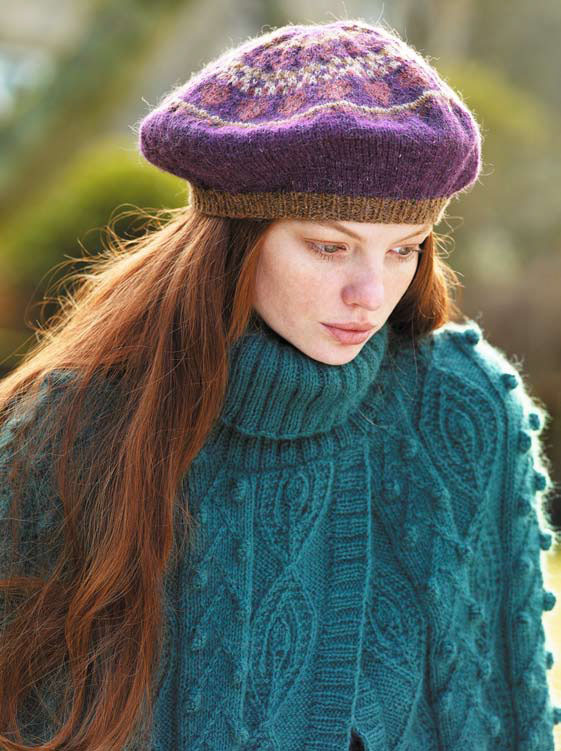 Q – This is my dye challenge the Fair Isle Beret featured in Prima November 2009! 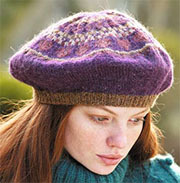 Will I be able to take the raw yarn below and dye it to match the purple, brown, and pink colors found in the beret? Saturday was rainy, windy day so I couldn’t go outside and use the Jacquard dyes, I don’t like using them inside. I stayed warm and dry indoors and used food color dye. I know, I know, these colors tend to be WAY to bright, but that’s what was in the house. After rewinding the yarn onto the nitty noddy, it was soaked in a mixture of Kookaburra Delicate and vinegar for 48 hours. 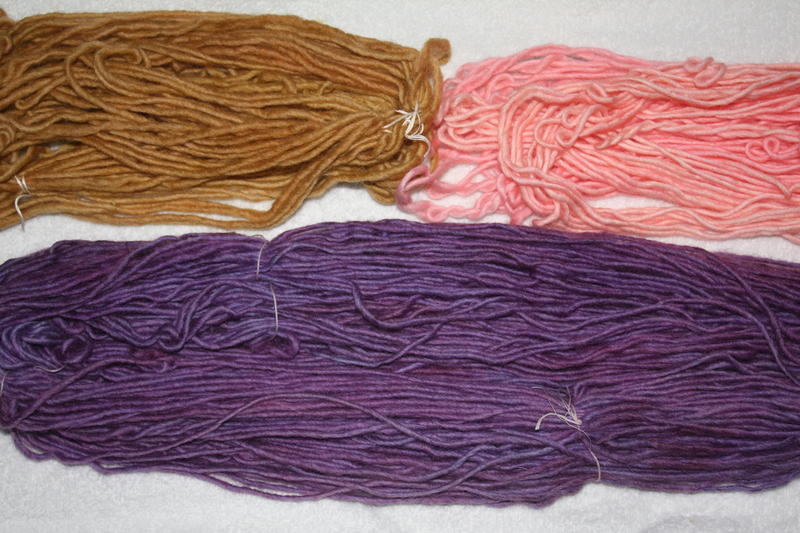 Since I don’t need as much brown and pink yarn, I made small 20 gram hanks which were soaked in the mixture for an hour. I used Wilton’s Food Coloring in brown, pink, and purple. See the dye splotches? I was just checking to see the colors. Very cool! They really do look BRIGHT! The brown looks more greenish. We’ll see! I started with the brown. It really looks green. Amazing how you can’t tell what color the yarn will be based on the color of the liquid. 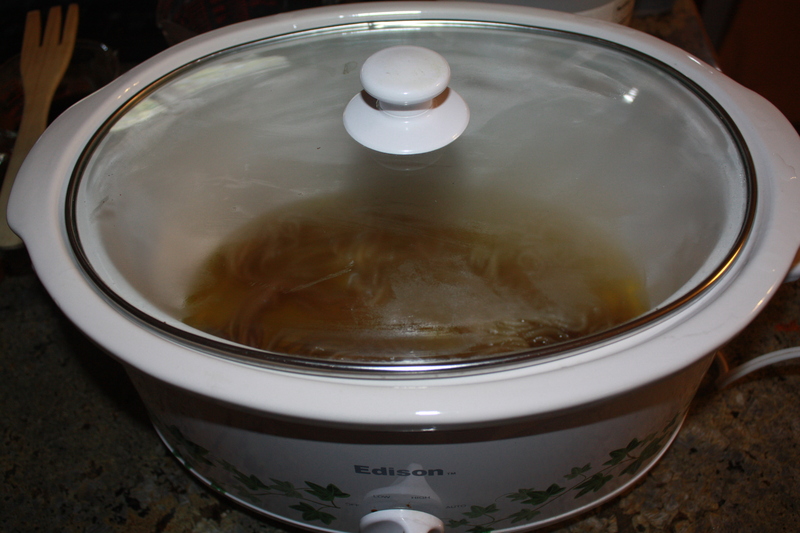 I added about 8 cups of water into the crockpot and poured in about 2 tablespoons more vinegar for mordant. I poured in brown dye until it looked as if it were dark enough. I was trying for a tan color, not dark brown. I’m thrilled with the crockpot that I found on Friday for $8! Another one of my fabulous thrift store finds. Thank you to the person who gave it away. Turned the crockpot to high. It took about an hour for the dye to be exhausted. Took the yarn out and cooled it. Really wasn’t 100% happy with the color so after I dyed the pink and the purple yarns I redyed the brown and it turned out perfect! The first time it was too mottled and there were green spots. The pink yarn was dyed next. Rather interesting that the pink dye left a pink rim around the inside of the crockpot. It turned out a bit to bright, even though I used about 1/8 teaspoon to 1 cup of water. 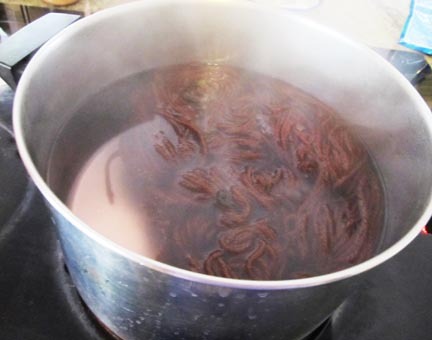 It was then diluted further when only a tiny bit was added into 8 cups of vinegar – water mixture in the crockpot. 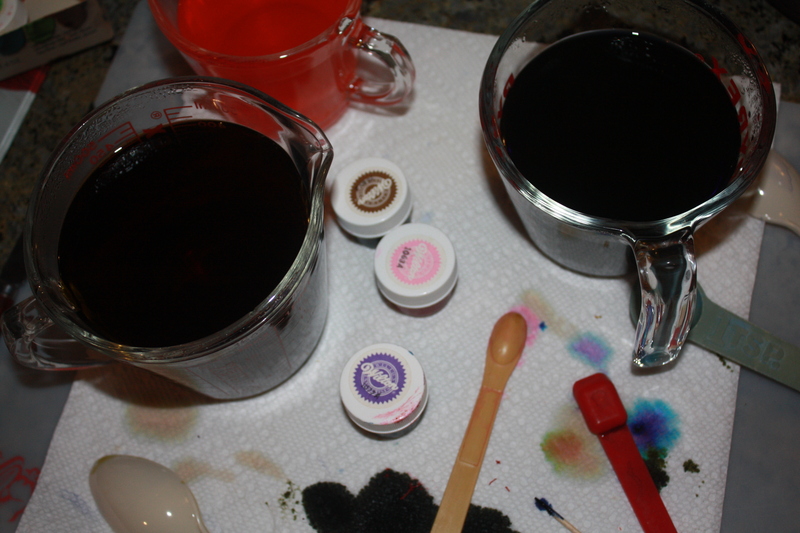 Everything I’ve read said that adding vinegar to pink food coloring or easter egg dyes would make a lighter color. Didn’t work in this instance. I put it into Oxyclean and desaturated it a tiny bit. Rinsed really well. Last to dye was the purple. It really came out mottled. I had soaked the yarn in yarn soak for about 48 hours so the yarn was throughly wet. 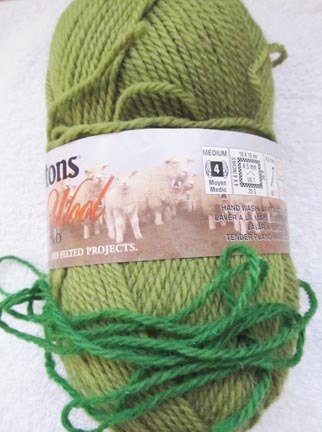 I have about 100 grams of wool. It took a few hours to exhaust the purple. After I took it out it didn’t look as if it was the purple I was looking for. It’s hard to see but the yarn is too periwinkle blue with lots of hot pink thrown in – definitely not what I’m going for! Pretty, but not up to meeting the challenge. So, I decided to wait until the morning to check it in morning light. Since yesterday was sunny, I took the purple yarn outside and studied it. It really was too periwinkle blue – hot pink- blue instead of a purple. It had to go back into the dye pot. Re-soaked the yarn for an hour. Then I made a mixture of two purple Kool-Aids. Kool-Aid has citric acid as the main ingredient so I didn’t add any more vinegar to the water mixture. 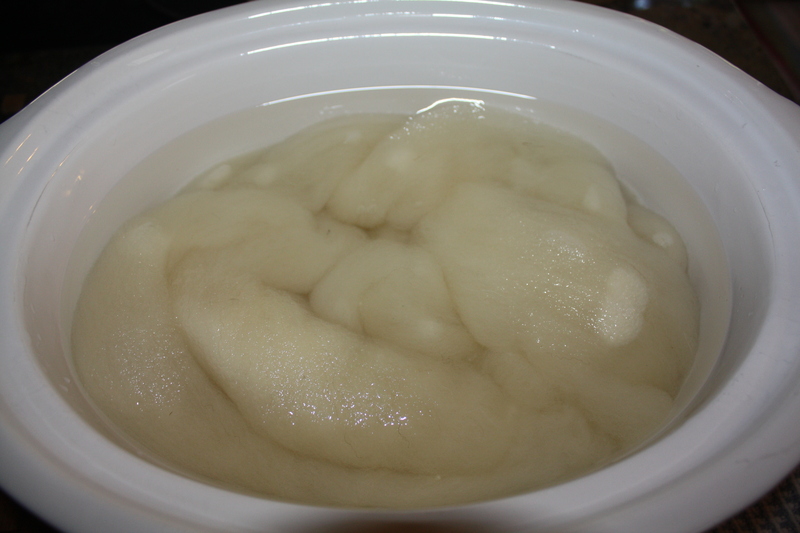 Added the yarn, plugged in the crockpot (lol), and heated the yarn-dye bath until all of the dye was exhausted. The dye was perfect. Voila! The results! The colors in “real-life” turned out quite well. Recap time: 1. The brown had to go through the dye bath twice, but the food coloring worked just fine, 2. The pink frosting turned the yarn “hot pink”. Redyed with pink lemonade and the results were a much softer pink. 3. The purple frosting gave a periwinkle-hot pink-blue color so I redyed with purple Kool-aid! I think the results are close enough to meet the challenge. What do you think? A note about yesterday – It was one of those days! 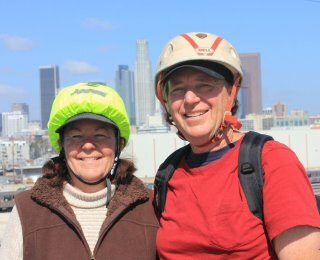 Sister Barb, Curls, was having a wonderful day, with her husband, at the bike race in Los Angeles. 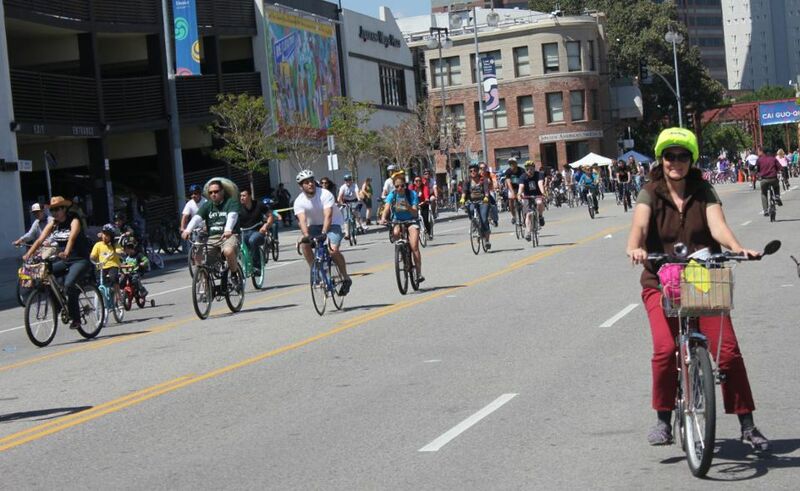 While riding along doing wonderfully well, her bike fell over on her. I personally think the bike turned into “Christine”. lol She ended up with a bruised, swollen ankle. Thus proving my point that yesterday was really Friday the 13th! Poor Curls is RICEing her ankle today so we aren’t having our Monday Meeting. When she’s feeling better she’ll probably tell you all about it. Ok, I had a tax reprieve from yesterday – they’re not due until tomorrow! So, ta-ta I’m off to have real fun! lol I just have to resist the call of the Siren aka Mariah the Spinning Wheel. Taxes, taxes, taxes! Years ago I read an very funny article can’t remember the author, think it was Gene Sheppard, or what the entire article was about. What I remember is the description of a car the author had that was an awful shade of green. He referred to the color as “goat-vomit-green”. That’s how I feel about this yarn. What was I thinking? 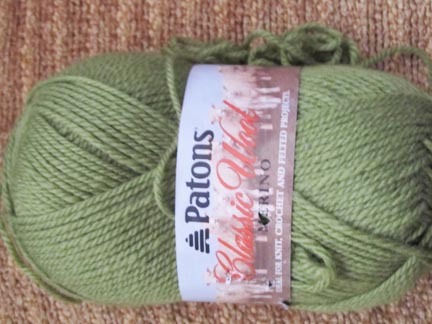 Try as I may, I could not get the digital camera to show the true ugliness of this yarn! I did make a yarn cake holder for my sister from the yarn Now, I’ve decided to try some Kool-Aid on it. I had a left-over mixture of Blue Ice Lemonade and Lemon- Lime so I tried that first. It turned into a beautiful green color. But, I decided it looks to much like a primary school color and that’s not what I’m after. Out came the nitty noddy and the ball was turned into a skein. I love my home-made nitty noddy. Made it from instructions found on the web at The Lost Pages. I brought the measurements to the hardware store and had them make the cuts for me. I spray painted it pink since I didn’t like the PVC pipe with the black writing on it. I made sure that I tied the skein in four places so the yarn won’t tangle. Skein went into the Kookaburra Delicate soak for 20 minutes. 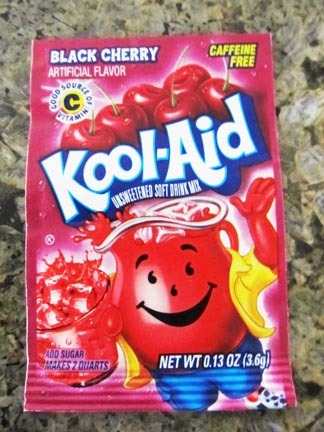 Since Kool-Aid already has citric acid added as the first ingredient, I didn’t add any vinegar to the soak or Kool-aid solution. I know different people have mentioned they add salt to the mix. I didn’t since salt is the second ingredient in Kool-Aid. Go figure! 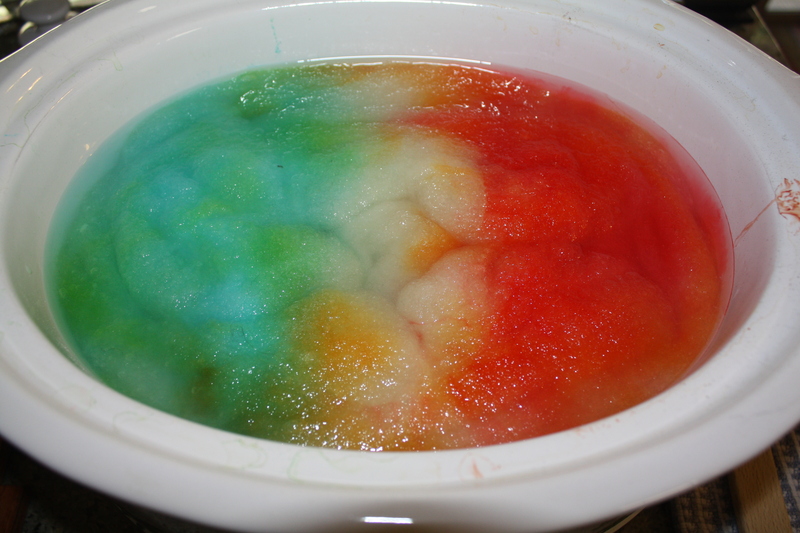 While the yarn soaks, I prepare the Kool-Aid mixture. It is recommended to use 1 package of Kool-Aide for every ounce of yarn. I have 2.5 ounces of yarn so I used three packages. I added about 72 ounces of water. Using my handy-dandy, recycled, plastic, 48 oz, mixed nut container as a measuring cup. 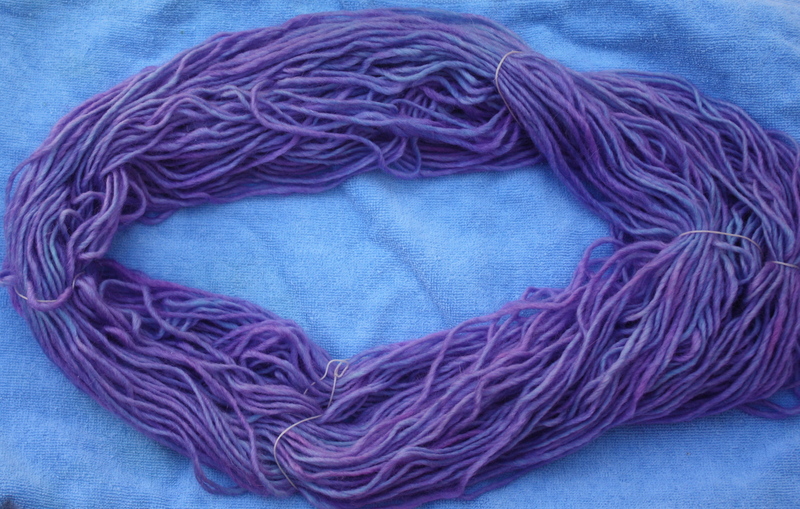 After 20 minutes, I squeezed the excess water gently from the soaked yarn. I don’t bother to rinse the yarn out. The yarn goes into the Kool-Aid mixture which is the same temperature as the soak so there isn’t any temperature shock to felt the wool. 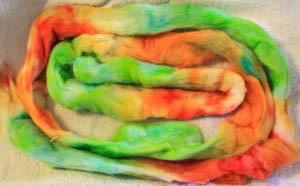 I push the wool into the dye bath so all parts are under. Now, I turn the stove on to a medium heat – just enough to cause the bath to simmer. I keep checking until I see that the dye has been depleted. You can see that the yarn has absorbed all of it. This lot only took about 25 minutes. Now I dump the yarn into a colander to drain. To cool the yarn down, I transfer the skein to this fabulous boot mat that I got for $2 at Target! I have to go back for more. I need some for planting my seedlings. 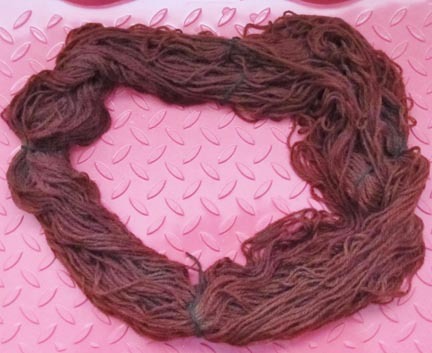 What you can’t see in the picture is that there is a slight variation in the way the dye was absorbed so the yarn has a great variation of colors. Now all I have to do is wait for the yarn to cool, gently rinse it, then soak in the Kookaburra Delicate, squeeze, and dry. I’ll post the dried yarn later. I’m going to stay home today and go out into the garden for awhile. My flowers are screaming for attention! Really have to get my flowers blooming. My house’s totem butterfly, the Gulf Fritillary, hasn’t been around much thanks to the winter. I had one last week and I’m sure it followed Barb home because she said it showed up at her place!! We live about 40 miles apart. I told her she’d better bring it back. This is the basket I keep by the back door and always take into the backyard. As a Girl Scout, I’m always prepared. 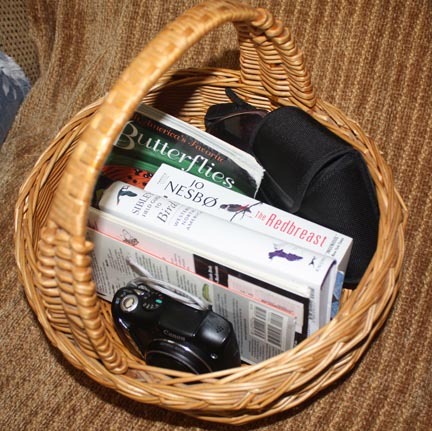 It contains: camera, butterfly book, bird book, sunglasses, a book to read, and binoculars.